Home → Awards → Who wants $50,000? Before publishing Buying Time in 2012, I’d done much soul searching. With only ten agents queried (a miniscule number when it comes to agent hunting), I longed for the validation of a traditional publishing contract, but wasn’t sure I wanted to spend years of precious time trying to find one. The day I heard about the Amazon Breakthrough Novel Award (ABNA) Contest, was the day I set my destiny in motion. I entered the contest in 2012, telling myself if I didn’t win I’d move forward with self publishing. When I didn’t even make the first cut, which is based on a 300 word pitch, I was disappointed. But my failure infused me with determination to get my work into the hands of readers. And, so I did. Of the 10,000 authors competing for the $50,000 grand prize, I was lucky enough to be one of the 2,000 authors to move on to the 2nd round. My excerpt was going to be reviewed by specially selected Amazon Vine Reviewers and based on their ratings Amazon would determine whether or not I moved one step closer to winning the Grand Prize. If I didn’t, I would at least be guaranteed a third prize: Two of the contest reviews completed by the Vine reviewers. The wait to see if I would make it into the Quarter Finals seemed to grow longer with each day. When the results were finally posted on April 14th, I was afraid to look. When I finally found the courage, I couldn’t contain myself. Buying Time had officially made it into the Quarter Finals round. 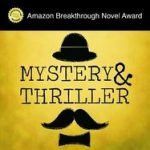 As of the writing of this blog post, I am 1 of 100 authors in the mystery/thriller category who still have a chance of winning a publishing contract with a $15,000 advance. And I am 1 of 500 who has a chance of going all the way and winning a publishing contract with a $50,000 advance. Further advancement is now in the hands of Publishers Weekly. All 500 manuscripts will be read and reviewed by Publishers Weekly and based on those reviews, Amazon will select only 25 authors to move forward into the Semi-Finals. Once in the Semi-Finals, a panel of judges selected by Amazon editors will choose five finalists. Each finalist wins a $15,000 advance and a publishing contract. One of the finalists will then go on to win $50,000 instead of $15,000 based on votes by Amazon customer. Will I win? I don’t know, but it is great knowing I still have a chance at one of the top prizes. Even if I don’t move forward into the Semi-Finals, I have officially won a second prize in the contest which is the Publishers Weekly review. I can use the review to promote my book (with the caveat that it was based on a review of the manuscript – though for me that is one and the same) or shred it if it happens to be a review that causes me to down a few pints of Ben and Jerry’s Late Night Snack. If you want to read the excerpt from any particular entry, you can go to the ABNA page, click on the list of quarter finalist to see the names and then go to the Kindle Store and search on the entry. You can download it for free and even leave a review. Or if you just want to browse all the Quarter Final entries, go to the Amazon.com Kindle Store and search on 2014 ABNA Entry. From what I can tell they are in no particular order. And to answer the question, “Who wants $50,000?” I do. What about you? Holy cow, Kelly, what a honor and a thrill. I’ve got my fingers crossed for you!! Your novel is a winner, no matter what happens! But I’m with Lisa, fingers crossed!